We are pleased to finally release Striking Ver 5.1.9.5. There is no .9.4 release - it was an internal version only. We have installed Striking 5.1.9.5 into our demo at Themeforest for all to view in action. Through your reporting and our efforts and testing, we believe we have eliminated the principal errors reported. As of this moment of writing, we have submitted this version to Themeforest for approval. Once I have finished these posts, I will be activating the API and you will see the update notification appear in your dashboard. This version features much more expansive help dialogues for several of the panels. Users both new and experienced should review the help fields, particularly the new dialogues for using fonts, for the clear cache and related settings, and in the update settings, to name a few. We tried to provide information based on all the usage questions we have received where appropriate. Activating a font for use is a 2 step process, and is detailed in the help field. This was a tremendous undertaking by all members of Striking (all of us are suffering from extreme sleep deprivation), and we also are grateful for both all the error reports, and solutions, proposed by users. Those reports, and your patience, has improved Striking for the benefit of all the user base. The code cleanups we have done have resulted in a faster Striking as well, according to our internal analysis, and we hope your experience will be the same. Below this comment I will be posting separate comment for error reporting (which will also note outstanding issues), installation for normal users, and another for Child Theme users. Child theme users should read the child comment very carefully, as the process of updating any site when one has a child theme in place is neither as easy, or as quick as a default install, and requires more expertise. The child version is 0.8, same as in Striking 5.1.9.3. Should you be a child theme user and uncertain what to do, post in the forum. ALL FIXES WILL BE ATTACHED TO THIS COMMENT. All core errors, or what you suspect are core errors, are to be reported in this version thread, rather then on the open forum. This concentrates the error reports in one place hopefully making it easier for everyone to track and discuss. Any code type errors reported on the forum will likely result in us asking you to cross post, and subsequent deletion of the external thread. If one finds a suspicious or non-conforming behavior, you should provide a url or a screenshot (a url is much preferable as it is the active scripting we really need to see in our developer tools), and if you feel it warranted, indicate in the comment that you have pm'd me (websys) with your wp and ftp admin level logins. We thank you to pay careful attention to the error posting guidelines as it really does make matters much more difficult to resolve quickly on your behalf when we are jumping back and forth. -->> Youtube video - advances while playing - Carryover as not yet resolved. Use manual transitions with navigation enabled, or pause on hover, to help mitigate. -->> Widget Buttons - hover color issues. color fails on hover. New. FIX ATTACHED. Less then 200 users have downloaded the update so we are attaching the fix for you to install by ftp, and all new downloads as of 845am EST Jan 7 will have the package from TF or the api with the fixed button files. Anyone who needs help installing this by ftp should send me a pm (click on my name) as the ftp install takes seconds. Should you need ftp help, please include your wp and ftp admin logins including url. You would install Striking Ver 5.1.9.5 in the same manner as you would install any other wordpress theme. You can install Striking by using the install theme function in your wordpress admin, or by ftp into your host setup. The Document folder contained within your download from Themeforest has a section on installation of the Striking theme. Go to your Themeforest account and download the Themeforest Striking package. Unzip this package so you can access its contents. You will see several files and folders. One of these is "striking.zip". This is the zip file you will select when using the WP Install Theme function. It is a large package, so be advised that once you start the installation process, it may take up to 5 minutes for your site to upload and install it. Do not panic if it seems like it is taking a long time! If you go over 15-20 minutes, then you have a problem - in which case you can cancel and try again, or use ftp to install. If all else fails, post a comment and we will get in touch with you. Which were draft runthroughs made for a prior series of Striking. While a touch rough around the edges we believe they will help guide you on what you download from Themeforest, what you actually need to upload if using wordpress to install Striking, and how to install it using the Wordpress install theme functions. 2) Another common installation issue is that the user receives some sort of theme installation failed due to it exceeding a certain memory size, or it just times out or goes on well past the 5 minute mark. In this instance, your host is likely a shared host (ie you have cheap web hosting) and there is a limit on the size of file you can upload using wordpress. Your options are to contact your host and ask or an increase in your php memory limit, or to install the theme by ftp. If for whatever reason the wp theme install function is not succeeding, one can always install Striking by use of an FTP program such as Cute FTP Pro, Filezilla, etc. This was the traditional way of installing WP themes and most other web software until early 2011, and is still the best method for certain types of situations. Any questions on installation, please put them in the regular forum, not in this thread for code and core errors. For existing users, here is the process depending on if you use a regular Striking installation. The Child theme will be covered in a separate post. Go to the Striking Advanced panel and scroll down to the Update Theme section which is at the bottom of the panel. Click on the "Save Changes" button after inputting your license code, your panel will refresh after saving and you will see yellow bar with the notification "page saved" appearing at the top of the panel. Now click on the "Update" button, and your theme should commence the update routine. Once the update is installed, go immediately to your Striking Advanced Panel, and in the General section go to the "Clear Cache" button and trigger it to "On" and save the panel. This clears the image temp cache folder. IF YOU FAIL TO PERFORM THIS STEP, MOST OF THE IMAGERY ON YOUR SITE SUCH AS SLIDER AND PORTFOLIO FEATURES IMAGES WILL CEASE WORKING! Now go to your homepage and other site pages and check to confirm that all your images and other media are working successfully. If you are still having a problem, see the section below "After Update I Have Site Issues"
You should now be successfully updated Striking. Sometimes when the above happens, it will not be obvious at all why the internal update mechanism failed. It just will not work! you first go to your Striking Color panel and resave it, and if that does not work, then you may have to check your Cache folder permissions. Then save the Advanced Panel, and then check your site. One might want to check one's .htaccess file - some users have added some custom code to their .htaccess file, and this has caused problems with updates. Try temporarily removing the .htaccess file and then resaving one of the panels or pages, plus clearing the cache, to see if that restores everything. If this works, then you will have to go through your .htaccess mods item by item to determine the problem. Plugins: We think by now most users understand that on occasion a plugin can interfere with a theme function. So one of the very first measures a user should undertake after an update, should they find an issue in the use of the Striking theme is to deactivate all plugins and see if that makes a difference. Please note that generally, most security plugins and askimet do not conflict with themes, so you might not need to deactivate them, unless the security plugin rewrites the .htaccess file. If so, deactivate this only as a last resort. In this circumstance, it is ok to message us as per the instruction below, without deactivating, if you are uncertain or uncomfortable about turning off the security. If all else fails, then please post a message on the regular forum, as installation is not typically a code related matter but usage related. Child users have a completely different update process!! Please read carefully. This striking version has a new child theme due to a change in the image sprite for the backgrounds. I have attached the new child theme, but you are best to wait for Themeforest to approve Striking 5.1.9.5, and it has not yet been approved with the new child (it is currently 9am EST Jan 7). - deactivate the child switching to the Striking default. - save their custom coding they have in their child to their local machine. - remove the old child theme by deleting it. The above is the recommended way to update a child theme. Anyone who is unfamiliar with the child updating process may wish to contact us first. Prior to making any changes, unpack your theme forest download, and unpack the child zip, and confirm that you have version 0.89by opening the style.css file. If you have a different version, or are missing it, send me a pm. We know we have many users who had sites professionally developed by a 3rd party, and a child was used, but they are unaware. So if in doubt, check with us first! I just updated to the new Striking 5.9.1.5 using the super dandy Striking internal update feature. All went super smooth. Six seconds and voila! James told me over Skype to update using the Striking's admin internal update API server. At the same time, he saw the update process happening in realtime on the other side using Striking API server. We wasn't expecting any problems (nor did I, for that matter). It just so happened we were online at the same time. And, being 5 hours apart, that isn't an easy thing to accomplish. Specially on a Sunday. Yes, Striking team is crazy enough to work on Sundays too! You really can't beat this kind of dedication and support! Please, start your engines and update Striking to the latest (and greatest) version. Make sure you read the update instructions above before attempting the update. After running some more tests, I'll update this post with a list of plugins I use. Thrilled to see that another update is there! I´m still downloading an old version from foresttheme? Can someone give me the correct download link? Can you goto the striking advanced settings, put in the purchase code, save the settings and then hit the update button. If that does not work follow the ftp update instructions above.. It is not likely approved by Themeforest as of yet. It will be a few hours, or more. We released in the api immediately, but TF will be behind. - The submenu is still not working properly. Hovering it changes the background color of the submenu, but not the font color. I've checked my settings and they are correct and it worked before the latest updates. - The behavior of the search button (in the footer) is also odd. I changed the color to brown, but when I hover the button it turns transparent and doesn't change back afterwards. I want it to work like the other buttons on the website. Also there are lots of issues with Internet Explorer 10. None of the buttons work correctly and the images aren't loaded. See attached screenshot. Thanks again for all your efforts! Can you send me admin login details in a pm? Paul will get to your site before I do assuming you send him the logins. It appears to me the hover needs to be reset on the nav items, but he will test to see if it is also an issue.. In respect of the buttons, I can confirm we have an error here - we adjusted our button script, and while I think it is working fine for buttons produced via the shortcode, I think some of the other buttons such as widget buttons that are assigned a background and/or text color are not picking up the script - the colors are failing on hover state. We will get on this on Monday. the cufon is fixed. Old code replaced with new one. Since you dont want all portions on the website cufon you cant turn on the font switch of the actual and font and you need to deal with this by custom css. fontFamily : "Matura MT Script Capitals"
Hey guys... is this a know issue? When I try to update I get this error. Can you try to update by ftp once the package is released at themeforest? Yes I have... I just wanted to give you guys a heads up. This error is actually usually host related. In most instances, it indicates that you have hit your storage limit for your webhosting. You have to love a host who returns this error for that issue, such as Hostgator. It could also be related to another aspect of the php on the server, but hosting storage space limits tend to be the most common reason for this error. Nick, what you can do is log into your host control panel, and check to see how much of your storage you are using, if you are at or close to 100%, then you need to ask your host to increase your limit. Or you can wait, and go with our solution which will be launched shortly, and have unlimited space (although we have a restriction that on basic plans all storage must be related to the site - it is not the garage). Let me know the result of your hosting space allotment. You can also contact your host. The error is not Striking related, fyi. Trying to update. In my Striking advanced panel, I don't have an update option at the bottom of the panel? what striking version are we talking about? I have just looked at my current Striking version, which 4.0.2. Maybe this is why there is no update options at the bottom of the advanced panel? that version does not have that function. You need to update by ftp following the instructions as given above. Sorry for the inconvenience. The update process went smoothly but unfortunately it did not fix our site's problem caused by the earlier update version. can you pls turn off all plugins and check again if that resolves the issue? Unfortunately "turn of plugins" did not resolve the problem. Everything else works just fine except this "bold"-issue. This is what I would like you to do. 1) Please go to your Striking font panel. The first tab is general settings, and the first setting is for your Site Font Family. Please check to see if the default font you have enabled is Arial Black. If it is then please choose a regular font instead. Problem solved! 2)I went to your site, and did not see any cufon enabled. Please send me your logins by pm, and I will check out cufon. Also tell me in the pm what cufon you want enabled. I want to do this asap. We did extensive testing of cufon and super detailed instructions, in this update. If there is an issue I want to stomp it out asap. It looks like the issue with the featured images in IE has not been solved yet, am I right? what issue are you refering to? The featured images (can) only not show in compatibility mode of the browser as fas as i am aware of. Can you please advise. that in IE10 featured images aren't loading (the load animation keeps spinning but images do not appear). Is there something in particular that I should check? make sure your ie10 is not running in compatible mode. Try to clear your striking cache, clear your browser cache. I wanted to advise that as of yet, we at Striking have made no efforts to develop custom css for IE10. It is not a Themeforest requirement (in fact the option does not yet even exist for us to certify as IE10 compliant in our developer interface with TF) at this time either. We will be working on IE10 compliance for our next update. When we turn our attention to this, if there is an easy line of code we can supply, we will add it to the forum. It should be in the next 2-4 weeks. But as of this moment, this is not a theme error, as it is neither a stock theme ability, nor a requirement of TF. good to know that you've acknowledged the problem in IE10. and everything went fine! WOW!!! btw: the existence @font is cut off at the top... maybe you can fix it some time? Thank you so much for your help! You made it super easy to get things updated! If I wanted to update via ftp, do I simply download, extract and transfer with overwrites? Thanks! --------------------------YES!!! Worked. Thanks so much for all your help! Any help you could send my way would be appreciated! Thanks! Worked great! Thanks a lot! Super, it was just a build issue. in the api the files have to be assembled in a certain fashion. Sometimes when a build is done, an error can occur, and when when we did the inclusion of the button fix a while ago, the build was done, but the not test of the build. It had a problem. I just addressed it. So now i think we are off to the races. Will follow for everyone elses remarks. please be advised that after you have each reported, I will be deleting all but one example, so that the thread remains "lean" and really focused on actual core errors. One moment please, I am going to check the build. I know kappy went in and did a file swap a few moments ago, and perhaps there is an issue in the api build as a result. If so, i will advise, and I will temporarily cancel the build until I can redo it. Give me a few minutes to confirm. I have confirmed there is a problem with the build. It is not a theme error per se but rather an error in the api build. I will work on fixing. I have temporarily disabled the update notice while we fix this. I believe I have fixed the build. If some of you who just posted could be so kind as to try again, and let me know the results - you can edit your post above with the result. It should not be at all - this is actually the fastest striking ever. Can I ask, have you cleared out all your page revisions? And how many fonts do you have "active". Go review the new font help fields in the Striking Font panel. If you have a whole bunch of fonts showing in the Choose Font field for cufon, fontface or google, delete all the fonts you are not actually using - you might have 50 font scripts all running in the background, slowing you down terribly. You should not have more then 2-3 fonts "active". Please get back to me with an update. After updating to 5.1.9.3 the thin white dividing line under my menu has been removed. It should match the one above the footer. I know this is very minor, but any ideas on how to fix this? I think that is replaced and does not work anymore like it used to do. Try it like this and let me know if that is ok with you. Please put this custom css code into the custom css field of the striking general settings. That appears to have done the trick. Any reason this feature was removed? I think we removed it because of the problems with ff and chrome hardware accelleration. One last question: If I keep the divider line using the css code you provided, will that cause any problems for my site with ff or chrome? I dont think that would cause any problems at all. Thanks for all the info. I have successfully updated to the latest striking theme! There are a few clitches ( different fonts) but I'm sure I will iron those out. Great to hear. Just review those font help fields correctly. And remember that one should only "activate" the fonts one intends to use, and really, should be no more then 3 fonts across all font types. And only make one font the default font for all descriptive types, or you will crash! The server my site is on will not allow me to upload any more than 2 MB. So I gave them the zip file to do the upgrade for me. they said they tried several times, says it is uploading, just sits there and does nothing. What should I tell them to do? Do what you just did - call the pros! OMG you have awful hosting, especially when they are so lame they cannot install themselves on their own servers. Can you please send me a pm with your wp and ftp logins. I will install it for you. Hi Guys, I've just noticed my Audio playback isn't working in Firefox or IE9. Thanks. It worked but I see the start stop and another image are not rendering correctly so one does not know where to click to get things going - and that amounts to the same thing of course from your viewer's perspective!! We will get cracking on this for you. We updated the mediaelelement.js to the latest standard in this release. When I look at your page in firebug, I see the attached error, and it may be the mp3 encoding. I may have you send me your mp3 file. The shortcode does work in our tests. Can you also try another mp3 just to see what happens, perhaps on a test page that is not public? I have confirmed that the audio shortcode is working on his mp3, and the issue is plugin related. One is not jquery 1.83 compatible - thus it is not either wp 3.5 or Striking compatible, and it is blocking the image for the controls in the audio player. Should anyone else encounter an issue where the image of the control play and pause button is not showing, but on hover in the area you get an active link and clicking still plays - which it does on Nigel's site, then you have a plugin issue as well. The plugin is yet to be determined. Nigel has a number running, and I left it to him to deactivate them and test. I just updated to 5.1.9.5 from 5.1.9.3 on one of my sites. I am having strange behavior with a backup plugin BackWPup. When I run this plugin, the progress screen shows the backup going gradually up to 100%, but then it jumps back to something less like 39% and stalls. When I later access the log file, it shows the backup completed successfully. Sometimes I cannot find the file it supposedly created. I have used this BackWPup pluggin many times on this site. The only thing I did today was add a page for FAQs, and then update Striking. This is very unusual. Do you have any idea what might be the issue? I tried clearing cache and turning off all the other settings you mention above. I also disabled all plugins. For a minute I thought it might be working when I disable Formidable PRO forms plugin, but later I tried it again with all plugins disabled and it still did not work. Unless it is something weird with the host server since BackWPup obviously starts a job on the server. The website is busacad.org. You provide such excellent support. I thought I would see if you have any suggestions. I don't even know where to begin. Thanks. We have not seen you here in a while - hope all is well with your business. I do not know this plugin very well myself - Paul has some experience with it, but as our own servers all run backups automatically for us and our customers, we smile smugly at those who are with poor hosts who do not treat their customers so well - of course, we own our servers, so we do try to cover all the bases! I think the thing to do here is to speak to your host. You may also want to surf over to whatever help this plugin provides, although I see they have many unresolved threads. Thanks, James. I have asked hosting provider to review. I am doing very well, by the way. This is my second Striking site even though I am really a user not a developer. I am still a big fan. Not only a great product but you always provide great support and good directions on when and how to update, for example. Upgraded to 5.1.9.5 and many of the images on the site are not working: slide images and post / page images that are using lightbox. Also the top navigation drop-downs are not working, nor are the hover color background change for these menu items. I already took the above steps in terms of clearing cache, resaving Striking menus. And when I disable all plugins nothing changes. Any thoughts on what could be happening? Here is a little trick for anyone who is reading - it is one of the "thingys" we do when we read a comment about a matter such as your Colin. I surfed over to your site, and the first thing i checked was the source code - and I attached a screenshot of it below. I looked for the image links (I highlighted them in the image) and then i clicked on one - and as you can see, they came up! So what this tells us is that they are behind a wall, desperately wanting to some visibility, and something has put a fence in front of them. Ok, so we have a clue! Now you will notice the very first scripting error - a plugin called textcounter. To be confirmed, but it appears we have a cascading effect - its nudging into every other scripts territory like a drunken sailor, and causing all of the others to drop the ball. You are also running a cdn as well, zippykid not likely a culprit but sometime making it more difficult to diagnose what is occurring. The solution? Simple. First step we always undertake when we see something like this - turn off the plugins. Turn of the cdn, turn off the caching. Get to the bare WP and Striking install - and validate the installations. Goal here - since we know they work, is to confirm valid installs of the two. Clear your Advanced Cache at this stage, and save a panel, such as the color panel. Also flush your local browser cache as well. Now all the principal players are ready for the dance, and they just want to see who else passes muster! Then we turn back on plugins one by one, confirming prior to the next in line that the one just activated was not the culprit. Looking at the error console, i see the textcounter plugin, and also you can see there is an unusual js - "wpgroho.js.1" - whatever that belongs to - it might be another victim, or it might be another culprit. Once you find the guilty party, they get kicked out of dodge, as in this case, the issue is they are not jquery 1.83 compatible, so this means they are not wp 3.5 compatible - since wp 3.5 uses jquery 1.83. Do you want to give the above a shot first, and then get back to us? You can actually edit this comment and add to it right below this comment of mine. Hallo and at first sorry for my bad english. what is there the problem / my mistake? OH NO, not you too! You updated your Striking without following the procedures for when one has a child in place, from the looks of it. Ok, please send me your wp and ftp logins asap (click on my name and follow the nav link to send me a personal message), and I will see if we can rescue you from your situation! If you have a skype id, include that as well. Your english is fine and thanks for trying - no apologies are necessary at all! James - I see my workday is going to go well beyond 5pm - yikes! Thank you for your directly help. I load an backup and i get my old page back. Then i read, that i have to load only the striking folder for the update. but after that, i had the same problem like the first update. ok, i load again the old backup and get my page back. What i have to do for an successfully update? Ohh, i have strike child. is this different? greetz and thank you for the compliment. The procedure when one has a child is completely different! If you go to the top of this thread, the fifth comment down has the procedures for updating when one is using a child theme. Mike - do you need a child theme? What is in your child? If it is just some custom css, then stop using the child theme. It is for advanced users who know that child use is different. If it is only custom css post it into the custom css field in the Striking General Panel. Hallo James, thanks a lot for your help. One last question please. Wher i can deactivate the child theme? I'm having a weird issue with my striking update. On my dashboard, none of my options are clickable. I click on font and I can see the general tab, but none of the other tabs open. They do not respond at all. You have debug mode on in wp. Is that you attempting to debug? or your host? It appears you have at least 2 js errors, but until debug is turned off, or you give me ftp and wp admin access, not much i can do. Let me know, but be advised I am just about done for the day, and assuming you are in North America, the next support members coming online will likely show up when we are in bed. But you can always send me a pm with the logins, and i will poke around tomm. BTW - I have never seen that error before. Its a first, so you get the gold star for the day! I didn't add in a debug mode, so it must be my host. Any idea how to turn off the debugging? open your wp-config.php and turn off the debug directive in there. It should be set to false. if you still experience problems can you provide us ftp and admin login details to your website so we can investigate what is going on. you can click on my name and on the left send me a private email. I've just upgrade to the new version and I'm still experiencing the 'navigation cufon font hover issue'. When I hover over the main menu navigation it changes to a 'luna' style font. the easiest way is to go to the cufon settings remove all custom css in there (save it for later) and turn off the font by the cufon-font button. turn on only one cufon font. if that resolves your then you should review your css code used for the cufon font. Can you pls get back to us on this? I am experiencing the same problem as chickenrun regarding the 5.1.9.5 update. All is working as expected in Safari and Chrome but none of the featured images or images created with the Striking image short code are loading in IE10. The loading animation just keeps spinning but the images never load. Thanks for you attention and excellent theme. However in ie10 we have a circular icon. But we are not ready (yet) for ie10 with striking. We are still working on that. Striking contains no ie10 custom css at this time, and Themeforest has not ie10 requirements of theme builders. We are grateful for any reports that early adopters make about ie 10, and we will examine making them part of our next update for Striking. Thanks for you quick response Paul. Everything with 5.1.9.5 update is now working in IE9. Only problem is with IE10 and I understand that Striking is not IE10 compatible yet. Look forward to the next update that will include IE10 compatibility. Thanks again for such a great theme. Hi John. We took another look at your site last night, in order to determine what might be creating the issue with IE10. Upon inspection using a diff browser developer tool, we found that the slider you are using is throwing off a 2 different scripting errors. Now we cannot say definitively this is the cause of the failure of the Featured images to show in ie10, but it could be a cause, and the only way to rule it out would be to turn off the slider. I have attached a screenshot of the scripting errors. I also sent you a reply via the pm we have running. Updated and all working perfectly! Great to hear. Your welcome. If you only knew how we agonized over this release, to make everything perfect. So far, we have only two actual confirmed errors, both exceedingly minor. All the rest have either been usage mattes by users - the famous "oops i forgot I had a child theme", or compatibility with out of date plugins. We have now helped half a dozen plugin developers get up to date - jquery 1.83 and the latest quicksand are standards not yet widely employed. I've done as you suggested i.e. Removed the custom css code (this was the default code relating to Segan). Turned OFF Segan Font (I only had one turned on). If you need any help on this can you grant me access to the admin part of your website? Just send me a private email with the login details to the admin. Click on my name and then on the left you can send me a private email. Please also include a link to this thread so i know what the personal mail is about. i just checked your menu's again on all pages in all browsers. It is working fine. The problem was you had all cufon fonts loaded and only one set to active. This was causing the weird menu behaviour. we did put a tutorial about the howto on the cufon fonts and other fonts in striking 5.1.9.5. You can read more in that thread about the changements to earlier versions. Has the child theme been approved yet? Yes, it's already available. I downloaded it 3 days ago. May I ask how you attempted to load the custom logo? You should load it from your desktop. If you continue to have difficulties, can you please send me a pm (click on my name and then the nav link to send me a personal message), with your wp and ftp admins, and I will surf in and see what is happening. The function is widely used, thoroughly tested, and the only report we had to date of a problem, it turned out the user was trying to load their header background via the logo loader. Once they got straightened out they were fine. Please check the visual editor out, some weird font stuff going on in there, Striking is overriding the default WP stuff. can you tell me, what kind of folder you mean (updating with child theme)? Hi James! I should be more descriptive, sorry. The viusal editor is applying styles to the WP visual editor. In my screenshot you see that it is using some CSS, not part of WP core like Arial or something. I am having issues with WPML errors, so I am not sure Striking and WPML are conflicting. I'll disable some plugins and test in wee hours. Let me know if when you type text in the content area if it is getting some weird styling going on. Thanks! I dont see the issue either. Maybe it is another plugin causing the problem. Does it happen if all plugins are turned OFF? as far as i know we didnt do anything to the default wordpress editor. Your tinymce plugin however does. If you switch to text mode what code is around your text? We are the culprits. We BAD!! :D The styling files you see should not be there. They are actually from the default wp theme, and we were fooling around with them, and got so used to they being there, we forgot to remove them. They will be deleted in .9.6. You can delete them now. I'm new to updating our website (roller derby team). I was getting a "Cheatin uh?" error when I tried to upload the custom logo and realized I needed to update. Now that I updated I am no longer getting the error but when I click on "Insert Image" in the custom logo uploader section nothing happens. Please help! Can you send me admin login details in a pm? I want to take a look at this. HI James, I can't click on your name to send a PM. For info, I go to striking general settings and try to click on the upload logo button but doing that only puts a # at the end of the url. For info, I cant click any submenus in the striking admin panel either. I also disabled all plugins and that made no difference. It was working fine until I did an automatic update of the theme and updated wordpress core files. Hello, i dont know i got all things right: Has the issue with the wrong button background being solved? Yes the updated file is supplied and attached to the second reply in this thread above. So replace that file with the correct one. ah, yes i got it! At luxrenovation.com I've tried the automatic update and the ftp one both with the same results, almost 100% positive as per initial testing. One of the things that are not working after the update is the cufon font I've used before. As I've copied/imported the Striking options it should have worked automatically but it doesn't. 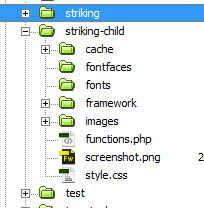 Both issues are to be seen on all tabs of Striking options. Pls try to clear your browser cache and striking cache. if you cant do it in your current browser try to use another one. Thank you for your reply. Clearing the browser cache solved my problem (because only clearing Striking cache didn't fixed it). The only thing is that I've lost my font type used before the upgrade even though I've exported/imported the Striking options. I have the same problem as costin...when I click on update in the stiking tabs nothing happens...it just refreshes the page. I sent a pm as requested above. after the update goto the striking advanced settings turn on clear the cache and save the settings. Also clear your browser cache. I had already put in the purchase key, saved the settings and did the auto update...that was fine. I also cleared the cache in the striking advanced settings and that did not fix the problem. I just tried clearing the browser cache and that did not work either. When I go to striking general settings and try to click on the upload logo button it still does nothing accept puts a # at the end of the url. I sent you the website info in a pm. are you using the child theme? pls also include ftp login details, plus what it is about. also add websys to the PM because i am about to goto bed because it is midnight and websys will take over from here and i will do so in the morning again. Updated by FTP, all went smoothly except I lost the Cufon font I was using - and I can't remember what it was! No matter, the default one works fine. I'm liking the new navigation inside the Striking options - nice work all! Thank you for the positive feedback in this section. We appreciate that if things work just fine and people tell us so. Update - I went into the user's setup and did load a logo for them. They have a large variety of plugins running, including some that are not certified wp 3.5 compatible and the overall mix is causing some "hiccups" with functions. The issue is not Striking related, although Striking is one of the victims in this matter. I spoke too soon! None of my drop down menus are working, hovering over them does nothing and clicking on them adds # to the URL and again does nothing. Also the Striking admin pages are not functioning as they should in IE. I'm going to go back through the plugins now disabling them again in case I missed something. Edit: Ok, I seem to have found the issue, at work none of the drop down menus work via the controlled internet into the school, but if I use my phone to tether for unfiltered internet then everything works just fine. Question is: what could be being blocked by the internet filter that is causing the drop down menus to stop working? They worked before the update (I was on two versions back), so it is something relatively new. I've now restored a previous version of the site until I know what's happening! Thanks. it stopped working because you had to clear the striking cache in the striking advanced settings and the browser cache of your browser. You also should check your wordpress menu settings maybe you need to re-attach the menu again. Why is there a style for TinyMCE now? Can you send us admin and ftp login details in a pm. Include websys to that conversation as well. also include a short discription about the issue.... we do get a lot of pm's and it issier for us if we have all the details. I apologize if this issue has been reported already, I've just now gone through the update. After updating to Wordpress 3.5, and updating the theme, I've got some custom sidebar/widget area issues. I have custom sidebars setup for each section of my site, which act as a subnav for each section. The titles of these have been jumbled and mixed up post update. The links in the subnavs are correct, but the title of each subnav is wrong. The main issue is that my widget editor seems to be messed up. I can't open any of my widget areas, edit areas or existing widgets, etc. I've tried from multiple computers/browsers and the problem persists. Even the 'Screen Options' and 'Help' Wordpress dropdown menus don't function when I'm on the widget page. They do function from all other pages as far as I can tell. I can provide admin login if needed. Jan 18. Just an update for everyone that I went into the user's setup, and it appears the problem is the magic members plugin which has what appears to be a jquery issue with one or more of its widgets, and as this script is loading first, and erroring, no other scripts are loading. So far as i can tell, not Striking related at all. Thanks for the reply. I tried both of the above and it didn't work. Is there somewhere that Striking pulls information/files from other than the hosted site? The menus worked fine and dropped down when the internet access was unfiltered, and didn't drop down when the internet access was filtered/restricted. This was on the same installation all that changed was the way the internet was accessed. I rolled back to an earlier version, and the problem doesn't appear.